Place the 2 unused A game tiles face down without looking at them back in the box. The B game tiles are used in part B of the game; place them in the box for now. Place the ship cards, colonist cards, ducat cards, and additional action cards on the appropriate spaces on the game board. Players may make change with the ducat, ship, and colonist cards at any time. For example, if a player has only a 3 ship card and needs to pay 2 ships, he will get 1 ship in change. Shuffle the expedition cards and place them face down on the game board. Sort the colony tiles by name and place them face up on the game board and place the spice sacks as a supply next to the game board. Spices, colonists, and ships are not pieces limited. If you run out, use some other tokens to represent them. 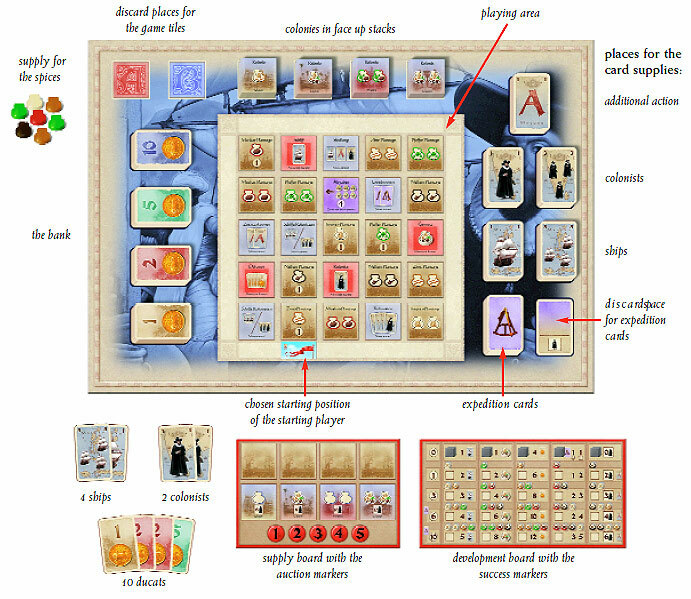 Each player selects a color and takes the supply board, development board and the auction markers in that color, placing the auction markers on the supply board. With 4 players, use all 5 auction markers, with 3 players, use only the 1-4 auction markers, and with 2 players, use only the 1-3 auction markers. Place the unused markers back in the box. Each player places 5 gray success markers in the top row of his development board and each player takes cards worth 4 ships and 2 colonists. The youngest player draws the top-most expedition card and the others follow in clockwise order until a player turns a card with a tiger symbol. This player is the starting player. He takes the flag and 7 ducats. The other players each take 10 ducats. Players keep their money secret during the game. The oldest player takes the role of the banker. Players place the expedition cards they turned over face up on the discard stack. The player with the most victory points wins the game. 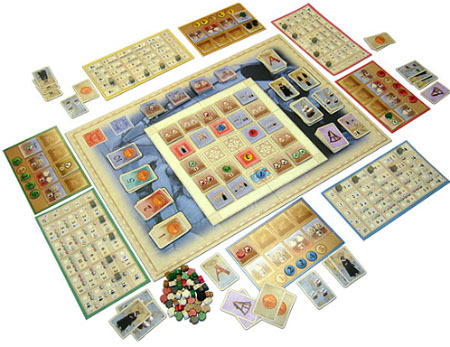 Players earn victory points for progress on their development boards, for colonies, for special tiles, for the player with the most money, and for expedition cards, which the players have in their hands at the end of the game. The game is split into two parts : part A and part B. Each part runs for 4 rounds. At the end of part A, players remove the remaining game tiles from the playing area and place 25 random B game tiles on the playing area, discarding the 2 not used as be fore. Then, the players start part B. At the end of part B, the game ends and players tally their victory points. The player with the flag begins. He places the flag on the game board and his number 1 auction marker on top of it. Then, the next player, in clockwise order, places his number 2 auction marker on a tile in the playing area. He must place his auction marker on a tile adjacent to or diagonal to the flag. The next player, in clockwise orde r, places his number 3 auction marker on an empty tile (without an auction marker on it) adjacent to or diagonal to the number 2 auction marker. The players continue in this way, ending with the starting player placing his highest numbered auction marker adjacent to or diagonal to the last player's auction marker. Players may not place auction markers on top of auction markers. The auction markers form a increasing number trail (1-2-3-4-5 with 4 players, 1-2-3-4 with 3 players, and 1-2-3 with 2 players). The starting player places the flag on any empty space in the playing area or on a space at the edge of the playing area adjacent to a space in the playing area. The player must place the flag so there is at least one space with a tile orthogonally adjacent to the flag (either horizontally or vertically; diagonally is not sufficient). On one of these spaces, or on a space diagonal to the space, the next player will place his number 2 auction marker. If a player, on his turn to place an auction marker, cannot do so because there are no empty game tiles adjacent to or diagonal to the previously placed auction marker, he chooses any empty game tile (without an auction marker on it) in the playing area and places his auction marker on it. The following players place their auction markers using this space as the new base. Thus, the number trail is broken, and may be broken more than once if subsequent players cannot place auction markers for the same reason. First, the flag is auctioned. To get the auction started, the owner of the flag (the starting player and auctioneer) bids 0 for the flag. Next, each player, in clockwise order, may bid once or pass. To bid, a player must offer a bid higher than the previous bid. The auctioneer has the last chance to bid or pass. The highest bidder takes the flag, 1 additional action card, and pays the bid amount to the auctioneer. If the auctioneer makes the highest bid, he keeps the flag, takes 1 additional action card, and pays the bid amount to the bank. If all players pass and the highest bid is 0, the auctioneer keeps the flag for free. The auctioneer takes his number 1 auction marker back, placing it on his supply board. Then, the next player takes his turn as auctioneer and auctions the tile under his number 2 auction marker. This auction runs like the flag auction with the auctioneer starting the auction at 0, each other player idding higher or passing, and ending with the auctioneer making the last bid or passing. The highest bidder pays the auctioneer (or the bank, if the auctioneer is highest) and takes the game tile. The auctioneer takes back his auction marker, placing it on his supply board. The auctions continue, in clockwise order, until all tiles with auction markers have been auctioned. Each player has 3 actions. The starting player (the player with the flag) takes his first action. Next, the other players take their first actions in clockwise order. Then, the starting player takes his second action and the other players take theirs in clockwise order. Finally, all players take their third actions, in clockwise order beginning with the starting player. To make it easier to keep track of the 3 sets of actions: after the starting player takes his first action, he places any spice sack from the supply on the flag. After his second action, he places a second spice sack on his flag and after his third action, he places a third spice sack. When a player chooses the progress action, he moves one success marker on his development board down one space to the row below. To do so, the player must spend spices and ships. The number of ships and number and kind of spice sacks required is shown in the area between the rows on the development board. In these areas are figures of 1, 2, 3, or 4 spice sacks. 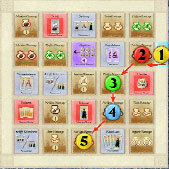 To move the success marker, the player must give up all the spice sacks shown. For each spice sack, the player must give up a ship. The player takes the required spices from his plantations and/or colonies, along with the required number of ships from his play area, and returns them to the appropriate supplies. Example: red wants to move his success marker in the taxes column from row 2 to row 3. He takes 1 pepper, 1 cinnamon, and 2 ships from his play area and puts them back in the supply to pay for the move. When a player chooses the build ships action, he takes ships from the supply. The number of ships he takes is shown by the position of his marker in the ship column. Example: his marker is in the second row in the ship column. The player takes 2 ships from the supply when he chooses the build ships action. When a player chooses the harvest action, he takes spices from the supply and places them on the empty fields on his plantations and/or colonies. The number of spice sacks he takes is shown by the position of his marker in the spice column. When a player's harvest is greater than the number of empty fields on his plantations/colonies, he takes only what he has room for. Example: the player takes 4 spice sacks from the supply. e.g. When a player chooses the taxes action, he takes ducats from the supply. The number of ducats he takes is shown by the position of his marker in the ducat column. Example: the player takes 6 ducats from the bank. When a player chooses the expedition action, he takes expedition cards from the supply. The number of expedition cards he takes is shown by the position of his marker in the expedition column. The left number is the number of cards he can take, the right number is the player's expedition card limit. A player may never have more cards than this, even for a moment! 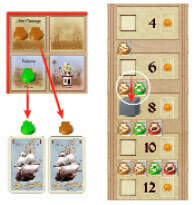 When a player chooses build ships, harvest, taxes, or expedition, he takes ships, spices, money, or expedition cards, placing them in his hand or on his supply board. 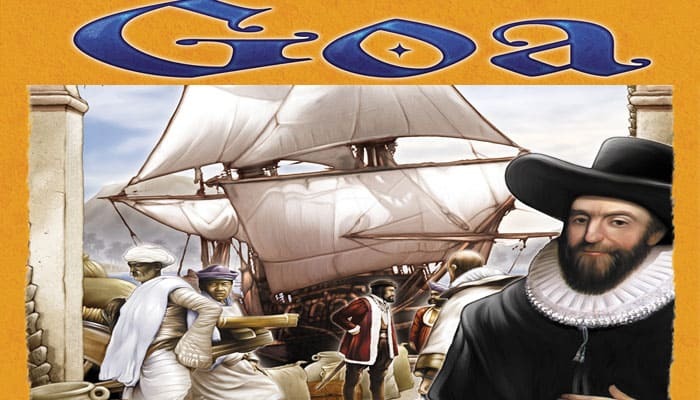 Players do not found colonies in this way (see below). There is no colonist action, whereby a player may acquire colonist cards. Instead, a player may acquire colonist cards by buying a colonist tile in a tile auction. What is the meaning of the colonist column on the development board? The number is the number of colonists a player must recruit when he chooses the found colony action. When a player chooses the found colony action, he attempts to found 1 colony. To found a colony, he must recruit a specific number of colonists: 6 colonists for Quilon, 8 colonists for Cochin, 10 colonists for Madras, and 12 colonists for Calicut. How does a player found a colony? First, the player names the colony (one of the 4 colony names). He may not choose a colony that he has already founded. For example, if the player has already founded a Madras colony, he may not found another Madras colony. The colonists that he has on his development board. The colonists that run to join him: he draws 2 expedition cards from the stack and counts the number of colonists shown on those 2 cards. If the above give him enough colonists, he is done. If he does not have enough colonists with the above, he must make up the difference by playing colonist cards from his hand. When a player founds a colony, he places the colony tile on the corresponding empty space on the lower row of his supply board. There are 5 different tiles with different spice combinations for each of the Quilon and Madras colonies. When founding one of these colonies, the player may choose from among the colony tiles remaining in the stack. The colony tiles for Cochin and Calicut are all alike. The player immediately fills the spice fields of the newly founded colony with spices from the spice supply. 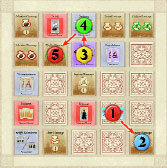 With Quilon and Madras, the player can choose between 2 spices.With Cochin and Calicut, the player can choose between all 5 spices. An attempt to found a colony may fail. This can happen if the player is unable to recruit the required number of colonists, including using cards from his hand. It is also possible for a player to have enough colonist cards in his hand to found the colony, but he decides he does not want to use the number required. In both cases, the colony is not founded, and the player takes 1 colonist card from the supply instead. The player discards any expedition cards he drew for founding a colony. Each player may keep only 1 additional action card. Thus, a player with more than 1 additional action card, must play, at least, all but 1 of those he has. The players put the additional action cards they use back in the supply. The player actions end when all players pass in player order. This ends the round. The game ends after the fourth round of part B. Then, the players score their victory points. The player with the most victory points is the winner. If two or more players tie with the most, the player among them with the most money is the winner. Victory points for the player with the most money: the player with the most money earns 3 victory points. If several players tie with the most money, they each earn 3 VP. Victory points for the single plantations: per plantation 1 VP. Victory points for the tile "Duty": When fulfilled 4 VP. Victory points for the tile "Mission": Per tile, 2 or 3 VP.